Cool Clubs and PGA National joined forces last fall, and the opening of our new club fitting facility has been a tropical, golfing dream come true. Not only are the hotel grounds famous for the four incredible golf courses it has to offer to its traveling golfers, but it is home to the Honda Classic PGA TOUR stop each year. The tournament has been played for 46 years and will award a $6.8 million purse for 2019. Throughout the years the tournament title has been captured by legendary players such as Jack Nicklaus, Fred Couples and Johnny Miller, plus newcomers Rory McIlroy, Rickie Fowler and Justin Thomas. This famous stop on the PGA TOUR is known for a few things besides its incredible scenery and the inviting Florida spring weather. 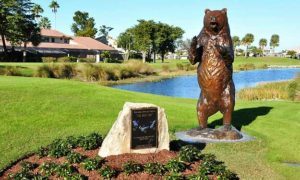 The course features some of the most difficult holes to attack on the entire PGA TOUR, including the frightening three-hole stretch known as the Bear Trap covering holes #15-#17. Its reputation is well-deserved, as it’s ranked as the 4th most difficult three-hole stretch on the PGA TOUR. The spectator areas around the 16th green also doubles as one of the greatest party spots in professional golf. The Honda Classic,like most PGA TOUR stops, focuses on local charitable organizations, with sponsorships and ticket sales supporting important causes in the greater Palm Beach County area. Each year year, the Honda Classic Cares strives to not only provide Palm Beach County with a premier, professional sporting event but to also raise awareness and provide a positive impact to youth in the community. Last year the organization was able to help over 40 schools, local youth groups and sports programs receive support with a goal of creating a brighter future for the entire community. If you’re going to be in the West Palm Beach area between February 25 and March 3, be sure to check out the list of activities and available destination packages during the star-studded Honda Classic. PGA National has a variety of accommodations that are both family- and golfer-friendly to help you plan the perfect vacation for everyone. For more information about the tournament please visit The Honda Classic website, or if you’re interested in booking a fitting with us or would like to receive more details about the Cool Clubs experience, please click the button below. Do you want to personally experience the unique Cool Clubs way of fitting? Call or click the button below to book your personalized fitting at Cool Clubs! Book your Cool Clubs fitting today!